I set to comparing a whole bunch of rhubarb recipes, and ended up deciding to make a traditional double crust strawberry rhubarb pie instead of a cobbler - since I have a pie crust recipe that I'm absolutely in love with (which I will probably share at some point). Since, as usual, I'm awful at following directions, I ended up combining elements of a few different recipes that I found online to create my own beast. Dough for two 9 inch pie crusts (top and bottom). I'll post my crust recipe soon! 1 1/4 c. sugar. I used normal sugar. I may experiment with sucanat or something next year. Heaping 1/4 c. cornstarch. You could also use a scant 1/4 c. of arrowroot powder. 2) Mix the filling ingredients in large mixing bowl. 3) Let the filling sit on the counter ~20 minutes, longer if you need more time to let the pie crusts get cold again. Try really hard not to eat all the filling during this step; you need to save enough to make your pie with! The filling is really good. 4) Meanwhile, roll out your bottom pie crust and put it in a greased, 9" pie dish. Put the dish in the fridge. Remember that with pie, keeping everything cold is super important! DON'T LET YOUR CRUST GET WARM! 5) Roll out the top pie crust and cut into lattice strips. Put the lattice strips in the freezer. I just roll my dough out on a pastry cloth and transfer it directly to the freezer, cloth and all. I have a chest freezer, so this is easy. It should get cold and firm before you try to put the pie together. 6) Use a slotted spoon to scoop the filling into the prepared pie dish. There should be a decent amount of liquid left behind - that's good! Leaving the liquid behind will result in a slightly tarter pie, but it will prevent it from being runny. If you like things sweeter, add more cornstarch and don't strain the liquid, or just increase the sugar. 7) Put your lattice top on the pie! 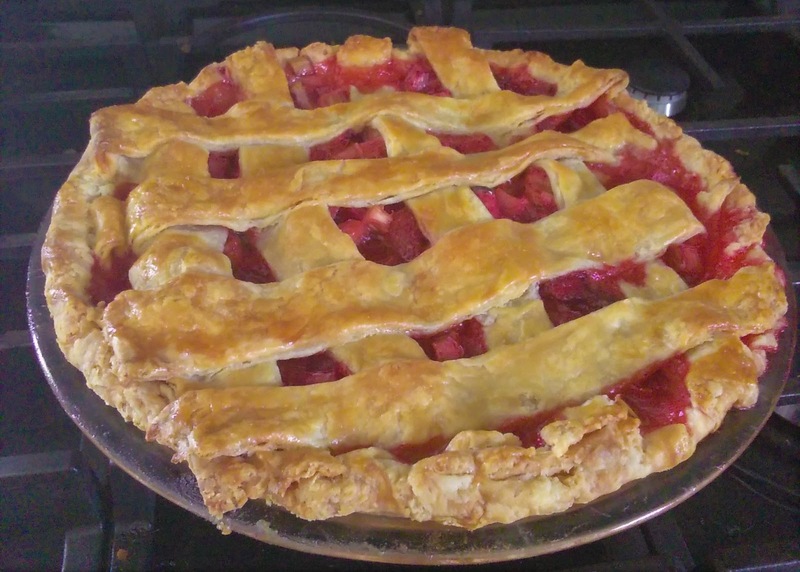 Some people make a lattice pie crust by weaving strips of dough. I don't do that - I just put strips over the top of the pie, because I don't feel like taking the time to weave dough for the sake of making it prettier. You do you. 8) Brush the upper crust with a beaten egg. 9) Place a cookie sheet on the bottom rack of the oven to catch drips. You will have bubbly drips. 11) Continue baking at 375 (F) for 50 minutes. The crust should get a nice golden brown. I did not use a crust protector or foil on the edges of the pie and the crust was browned but not burned, just FYI. 13) Serve plain or with whipped cream. The pie was a smashing success! In fact, my father in law said it was the best strawberry rhubarb pie he's ever had, and he's one of the greatest cooks I've ever met. Yay! It's sweet enough to please the average person, but tart enough to please people (like me) with anti-sweet tooths, and a perfect, not-too-runny texture that is hard to achieve in this kind of pie. two 9 inch pie crusts (lattice-top and normal bottom). 1) Prepare your pie dough - 1 normal bottom crust & 1 lattice top. 3) Let the filling sit ~20 minutes, at room temperature. 4) Use a slotted spoon to scoop the filling into the prepared. 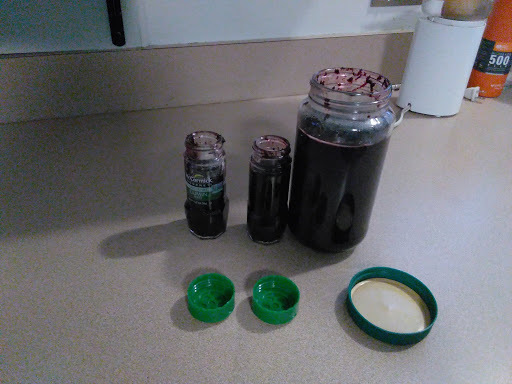 Let the excess liquid drain and discard it. 5) Put your lattice top on the pie and brush the top with beaten egg. 6) Place a cookie sheet on the bottom rack of the oven to catch drips. You will have bubbly drips. 8) Continue baking at 375 for 50 minutes. 9) Let cool, serve warm or cold, plain or with whipped cream.